It worked really well, the book was incredibly easy to follow, so well written and the technique works beautifully. 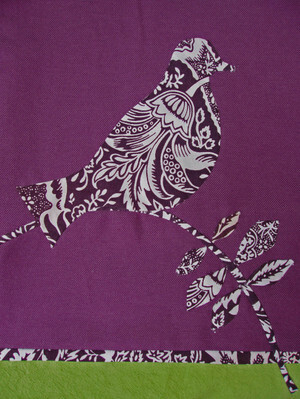 Preparing the pieces for applique is fairly time-consuming but actually applying them is a breeze. (Isn't that always the way with sewing?... It takes me an hour to cut out and prepare pieces for dress-making and then thirty minutes to construct). I had some problems with clipping and tucking under the fine pointed tips of the leaves so they are a tiny bit frayed in places. But the book does offer an alternative method (or four) which I can use to combat that when I come to do leaves again. I'm so glad I tested the technique before throwing myself into the apron (that's not how I usually do things!) because I've learned a lot and I'd have been gutted to have my finished piece spoilt by the little flaws in this. And I so highly recommend this book if you're at all interested in applique, machine or otherwise. I'm most self-satisfied with this bag because I used fabrics I had already. I usually jump on any opportunity to buy new fabric, but I'm starting to feel a little extravagant. The deep brown and white fabric I used for the applique is from a thrifted apron which I ummed and ahhed over buying for a few days (and it was only £1.50: crazy huh?!). I dyed the green fabric myself a year or two ago with a big project in mind which never came to fruition and I slipped the purple from David's shop before he closed it. So now I feel a little more eco-friendly and am on my way to justifying a new shopping trip! 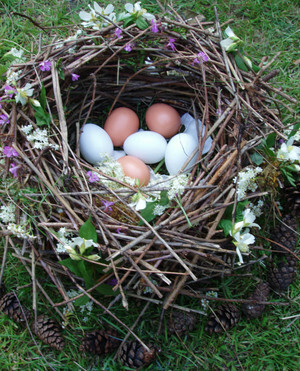 Continuing the feathered-friend theme, Annie and I made a bird's nest this week while Eliza napped. We got the idea from a book called 'I'm Bored', which is just full of great ideas for things to do with your children, most of them free and all excellent fun. And while I haven't decided to turn this blog into a book promo site, it would be really handy to have around during the Summer holidays. (See this post and the great comments for more inspiring ideas also). 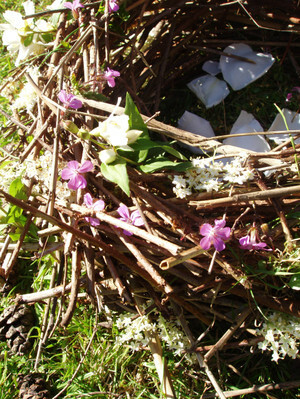 We constructed it by building up our nest from a hexagonal base, overlapping the twigs slightly at each corner. Then Annie lined it with moss and we decorated it with flowers, petals, leaves and pine cones. It was an incredibly enjoyable, thoroughly therapeutic activity. I would still have loved it even if Annie wasn't there(! ), but it was obviously all the more sweet because it was something we could do together. Jun 7, 2007 9:52:42 PM | I made this:, What Fun! That applique is GORGEOUS! Such a phenomenal design. I think you have found your calling! I am blown away by this design. So pretty, so detailed. And the color combinations are just so complementary. I am definitely going to be on the lookout for that book. gorgeous work!!! love the bird theme.And love the pic of the girls!! I am super impressed with that bag. i cannot imagine how long it took to cut out those pieces! You should be proud. It is lovely! The bag is so lovely and even more so because of the fact that you used fabric already one hand - oh do I know how difficult a task that is, I am always ready to rush out and buy new yarn. And I love, love, love that nest. I need to get that book. what a gorgeous bag. I'll have to look the book up... I'm scared of applique! Hi Girls!!!! Love them! Oh you and Annie making abird nest, how sweet! 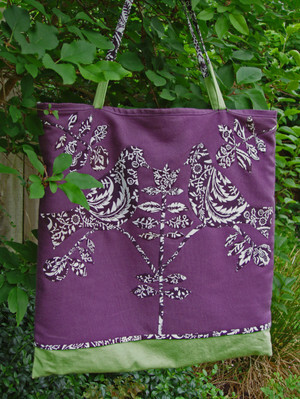 Your bag is so amazingly lovely! And why of why has it taken me this long to find your wonderful blog??! Totally absolutely gorgeous. I love it so much. I think I may have to check out that book. love the applique. very nice work! invisible machine applique? something new to try. love the bag. first time at your blog. your work and your children are beeeuutiful! 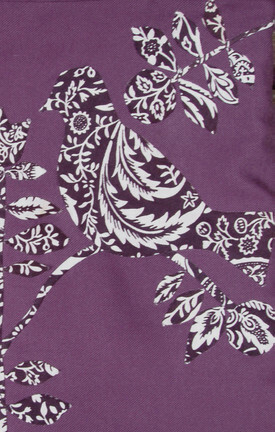 I am swooning over all this birdie goodness! The bag = pure love! I spend copious amounts of time making things and then blogging about them when I really should be working/cleaning/ironing/looking after my children.